The data collection toolkit was developed to support data collection with AIAN families in their homes. Guided by years of work providing technical assistance to Tribal Home Visiting Program grantees, the toolkit addresses common grantee needs and challenges. Although it was designed for grantees—including program managers, evaluators, home visitors, and other staff—it also may be useful for early childhood programs and others who serve AIAN communities. The data collection toolkit supports culturally rigorous data collection. Good decisions are driven by good data—information that is consistent, accurate, and complete. Quality data help programs tell stories about participating families, services, and outcomes that they can rely on to inform decision making. Data collection has never been more important. Programs need data to apply for increasingly competitive funding opportunities, meet ambitious grant reporting requirements, and address participants’ needs with evidence-based strategies. Tribal Home Visiting Program grantees are required to collect data for continuous quality improvement, performance measurement, and program evaluation. The purpose of the toolkit, intended audiences and how to use it. Download Introduction in Microsoft Word format (.docx, 872kb). Training staff on the basics of data and how they can collect and use data. Download Module 1 in Microsoft Word format (.docx, 919kb). Planning and building a foundation to collect quality data. Download Module 2 in Microsoft Word format (.docx, 919kb) and additional resources used in Module 2: Activity 2.2 Jeopardy Game (PowerPoint) and Tool 2.4 Data Collection Scheduler (Excel). Supervising data collection and implementing quality assurance. Download Module 3 in Microsoft Word format (.docx, 919kb) and an additional resource used in Module 3: Tool 3.11 Inter-Rater Agreement (Excel). Program managers may deal with data collection from planning and oversight to data entry and analysis. They typically make decisions and ensure that staff understand their role in data collection and are trained and supported. Open communication between program managers and staff is crucial for troubleshooting challenges. 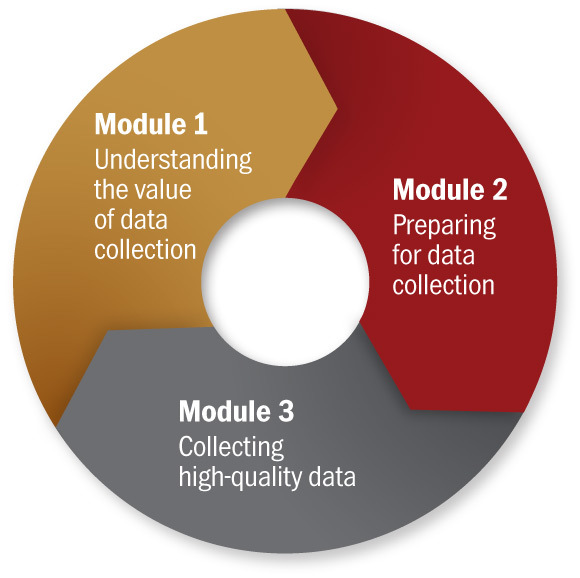 Program managers are often asked to present data to stakeholders and funders, so they must have a solid understanding of why data collection is important and how it works. Data coordinators (also called data managers) play a critical role in collecting, entering, managing, and reporting data. Data coordinators help home visitors keep track of which forms need to be filled out and when. Having a data coordinator to focus on data-related tasks maximizes the time home visitors and program managers can spend serving families. Like program managers, evaluators ensure that staff appropriately use, interpret, and store data. They develop and implement guidelines for administering and interpreting evaluation instruments. Examples include writing data collection protocols, establishing consent processes, identifying and reviewing instruments, and selecting data systems. Evaluators may support data entry and analysis, data quality reviews, and reporting. They also help promote collaborative community-based evaluation practices. Home visitors are the faces of the home visiting program in the community, and they are typically responsible for collecting data from program participants. Home visitors help ensure that the program collects high-quality data in a way that is comfortable for the families the program serves. They are often tasked with explaining data collection to families, administering data collection instruments, entering data into databases, and communicating assessment results to the families served by the program.